Oaks are actually helped by fire. Large oaks have thick bark that withstands a fire that will damage or kill most other trees. Fire clears the ground so that acorns contact mineral earth rather than landing on top of grass and leaves. When a small oak tree is killed in a fire, it re-sprouts from the roots more vigorously than most competing trees. When our ancestors arrived in Michigan, they found prairie grass with widely spaced oak trees. Prairie grass is highly flammable. Frequent fires kept most trees from getting established and turning the prairie into a forest. The people living here at the time allowed the fires set by nature to burn and when necessary, they helped things along by starting fires themselves. The reason oaks were the dominant tree species was their ability to grow in this fire-influenced environment. The combination of fire suppression, and the development of land for housing and farming. eliminated the prairie grass. Over time, competing trees that were not fire-resistant were able to grow and oaks struggled without the advantages that frequent fires gave them. Exotic trees and shrubs have been added to the mix, making matters worse. Farmland and rural development continues to displace woodland. 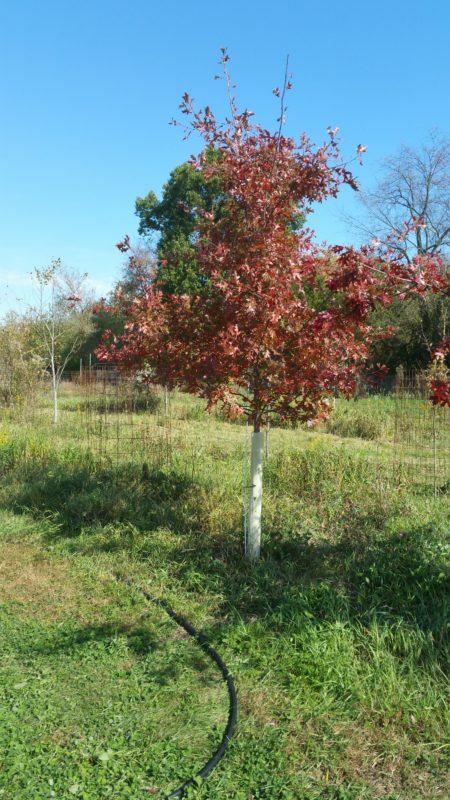 At the Dexter Tree Farm, we grow all the oak varieties native to Michigan that we can find local seed sources to plant. They seem to remember how to thrive here once they are planted. We hope that you will decide to include our oaks in your landscaping plans. Since farming seems to be here to stay, our goal is to grow as many oaks as we can in the spaces in-between. Oaks are an important part of the ecosystem that is still functioning under the radar in the fence rows and on vacant land in competition with new exotic and invasive plants.